Dogs often present to ophthalmic services with superficial non-healing corneal ulcerations that have persisted for weeks or even months. These ulcers are also classified into various types including spontaneous chronic corneal epithelial defects (SCCEDs), indolent erosions or ulcers, and Boxer ulcers. Clinical signs of these chronic ulcers tend to wax and wane, confusing and frustrating both clients and veterinarians. Eyes with these ulcerations may also further deteriorate in their appearance due to corneal neovascularization and the development of granulation tissue. Traumatic events are a suspected etiology of many corneal ulcerations. However, without visual confirmation of the previous trauma, other possible causes must be considered. Corneal ulcers may arise secondary to disorders including distichiasis, ectopic cilia, foreign bodies, entropion, dry eye, tear film quality disorder, facial nerve paralysis/paresis, neurotropic keratopathy, lagophthalmos, exophthalmos, bacterial infection, viral infection, fungal infection, endothelial corneal dystrophy, and anterior lens luxation. Successful resolution of a corneal ulceration will often depend upon identifying its etiology. The etiology of most non-healing corneal ulcers is typically never determined. SCCEDs are characterized by a superficial hyalinized acellular zone within the corneal stroma that may prevent normal adhesion of the stroma to the epithelial basement membrane. This separation results in corneal ulcerations that may appear to “heal” but then tear open again with simple movements of the eyelid conjunctiva across the corneal epithelium. Neovascularization is commonly associated SCCEDs. In most other areas of the body an increase in vasculature expedites the removal of necrotic tissue prior to regeneration and remodeling. However, in SCCEDs the unhealthy tissue (hyalinized acellular zone) is very slowly removed over the course of several months. To speed up the healing process of these ulcers, several techniques have been developed including debridement of redundant edges of corneal epithelium, burr keratectomy, grid keratotomy, and superficial keratectomy. A burr keratectomy can be used to uniformly break down the hyalinized acellular zone of SCCEDs, whereas a grid keratotomy breaks through the hyalinized tissue in a grid pattern. Even filing of the acellular zone with a diamond burr provides an immediate visual improvement that surpasses that of a grid keratotomy. Resolution rates for SCCEDs are similar postoperatively for both burr and grid keratotomies. Prior to keratectomy dogs receive a pre-operative NSAID or opioid to prevent pain. Topical anesthesia is then applied during the procedure to prevent pain for about 20 minutes. A disposable contact lens can also be applied to prevent discomfort in the immediate postoperative period. Oral NSAIDs and/or gabapentin are then typically prescribed for further pain management at home. However, squinting for 24 to 48 hours following keratectomy is typical of many dogs. To prevent postoperative infection, corneas are prepared with 0.2% povidone-iodine prior to burr keratectomy. To prevent the formation of bacterial biofilms upon the postoperative cornea topical antibiotics are applied minimally every 8 hours. Conjunctival bacterial flora can develop antibiotic resistance within 2 weeks. Consequently, postoperative antibiotic treatments are usually revised from any preoperative treatments. An ointment of terramycin has been show to increase healing rates beyond that of other antibiotics for postoperative non-healing ulcerations. Patients are also fitted with E-collars to prevent self-contamination and/or trauma following a burr keratectomy. Severe blepharospasm, yellow-white corneal infiltrates, and/or purulent discharges appreciated by clients postoperatively may indicate infection and need to be treated as an emergency. However, most SCCEDs do not become infected postoperatively and heal within 10 to 14 days following a burr keratectomy. Within 5 to 7 days of the procedure many dogs keep their treated eye fully open and appear comfortable to their owners which then “relieve” their pet of the E-collar. If you have any further questions regarding burr keratectomies for non-healing corneal ulcerations, please feel free to consult with a veterinary ophthalmologist. Figure 1. 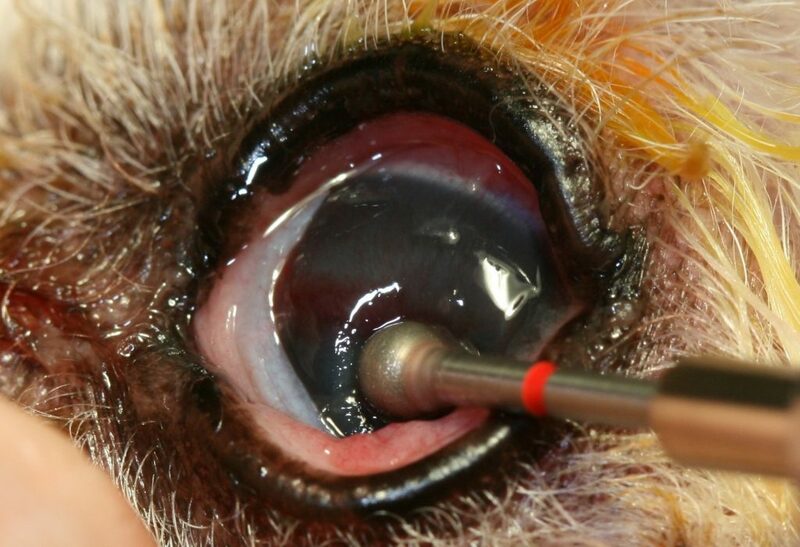 A burr keratectomy performed on the left eye of a 12-year-old F/S poodle.